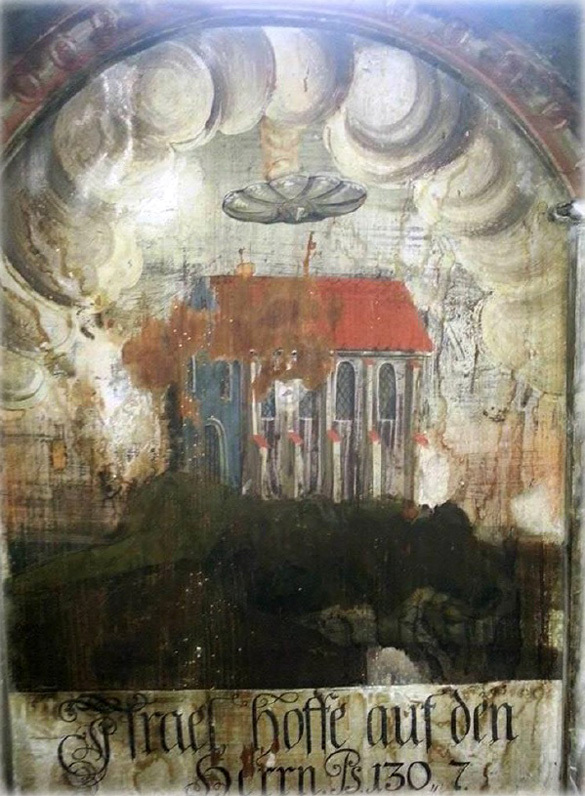 A UFO research organization in Israel has sent out a report regarding a wall painting in a 14th century church in Romania that may depict a UFO. It is similar to objects seen in paintings and coins ranging from the 4th century to the 17th century. One UFO investigator feels that the objects in the images may have an explanation that is more down to earth. Gilli Schechter and Hannan Sabat of the Israeli Extraterrestrials and UFOs Research Organization (EURA), say they received a picture of the painting from Catalina Borta. Borta took the picture while visiting the Biserica Manastirii, or Church of the Dominican Monastery, in the town of Sighisoara. Sighisoara is believed to the birthplace of Vlad the Impaler, the inspiration for the legend of Dracula. The wall painting depicts a disc-shaped object over a building that is emitting smoke. It also has a caption in German that reads “Israel, hoffe auf den HERRN,” which translated means “Israel, put your hope in the Lord.” EURA explains that this is a quote from Psalms song of ascents, c.130 v.7. The painting appears to be very old, but it is hard to tell how old. According the Monastery’s website, it was originally built in the 14th century, but was destroyed and rebuilt in the 17th century. The EURA report also notes that they are unsure who painted it and when. However, they point out that the caption in the painting probably dates it to after 1523, when the bible was translated into German. EURA also notes that the painting is not often referenced in UFO research regarding depictions of UFOs in art. However, the image does look similar to other paintings and coins which are commonly believed by UFO researchers to depict aerial anomalies. One such image is from the Prodigiorum Liber, which was an account of mysterious occurrence in early Rome written by Julius Obsequens. The image in question is supposed to depict a round object that was seen at sunset with a “large beam of fire” to the right. This sighting is supposed to have taken place in 98 B.C. Image from the Prodigiorum Liber. 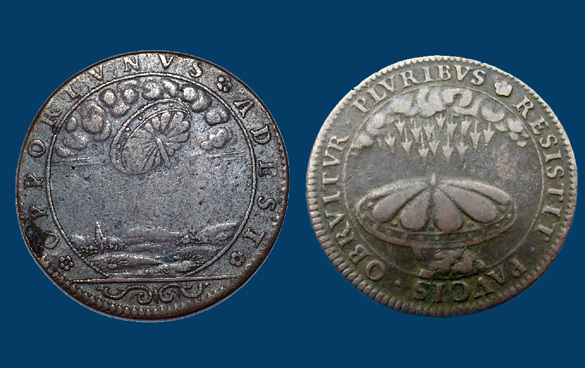 There are also French coins from the 17th century with a similar round object. Some researchers believe these to be depictions of Ezekiel’s wheel. However, Marc Dantonio, Chief Photo/Video Analyst for the Mutual UFO Network (MUFON), has another explanation. He says the shield-shaped object in these images is just that, a military shield. Dantonio came to this conclusion by researching France in the late 1600s. He found the shields of that period did appear just like the images depicted in the coins. Furthermore, there was a civil war in France in 1680, in which the territorial aristocracy was replaced by the absolute monarch of Louis XIV. He believes the shields were placed on the coins to illustrate King Louis’ strength. Coins from France called Jetons. These depict the shield images that are often believed to be UFOs. 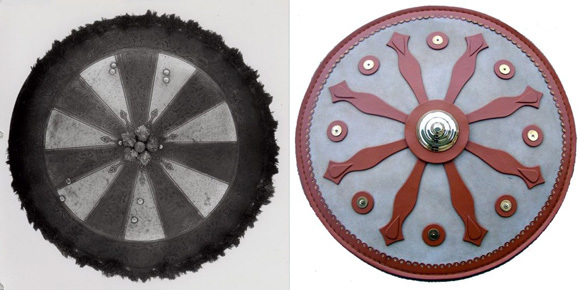 Images provided by Marc Dantonio of a couple of shields from antiquity whose designs look similar to those in the “UFO” art. He points out that on another coin, arrows can be seen raining down onto the shield as in an archer’s attack. He also notes that in some cases a line can be seen coming from the center of the shield, which is often mistaken for a ray of light coming from the craft. However, Dantonio explains this is actually a piece of metal that is attached to the shield to deflect arrows. It makes you wonder where they got the imagination to even think something could fly in the sky back then. Unless they actually saw something. You may enjoy reading, “Majestic Twelve Minus One.” Available at sky-fy dot com. 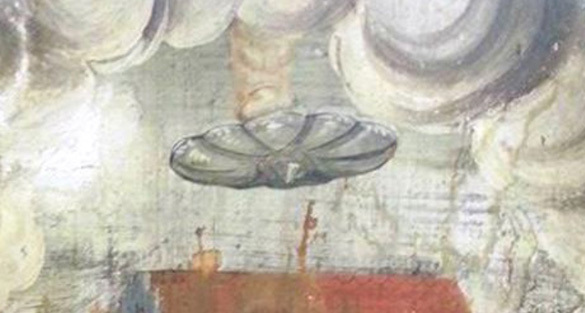 The image in the painting is still a ufo and here’s why. 1. It is in fact resembling a shield, but lets not ignore the obvious – it is shown in the air and trailing bright orange light and apparent smoke. 2. 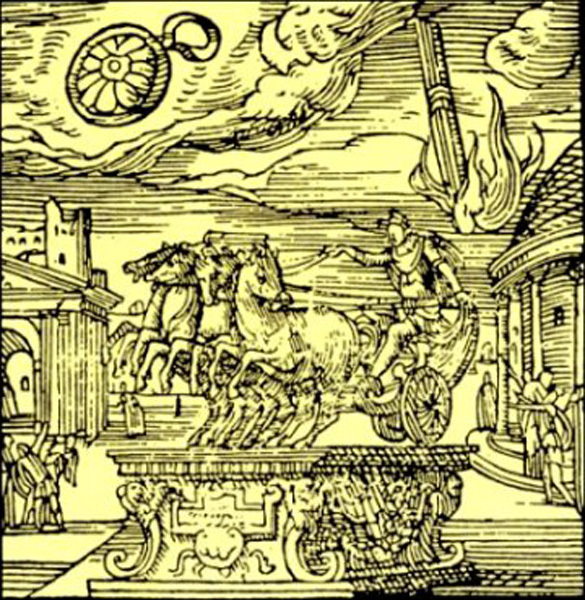 The existence of shields that look like the ufo (or whatever the object in the air is supposed to be) means only that the artist used a metaphor he had close to hand to illustrate the ufo, which he did not have another metaphor to describe. This is the same dynamic as the biblical pillars of smoke and fire that describe the coming and going of gods and their vehicles. When we see something novel we have to have a way of understanding it, and our mind works by analogy and metaphor, and so it grabs onto anything the ufo looks like. Compare this to the infamous “cigar-shaped” ufo’s. Why “cigar”? Because when they were first commonly reported people had cirags in their minds. TOday we would not create that metaphor. We would reference some other cylindrical object, but probably not a cigar. Nonetheless, the likeness of the shield is strong, and so the author of this article is correct, to a point. But he did not take it far enough. The image is a dead ringer because that was the mental referent the artisst used to describe the object he waqs clearly showing IN THE SKY. Marc Dantonio, Chief Photo/Video Analyst for the Mutual UFO Network (MUFON): Yes, “shields of that period did appear just like the images depicted in the coins.” (Well, “similar to”, not “just like”). But that is because shields were ubiquitous to the period. They were a familiar, recognized shape. People looked up and saw a shield shape – so they depicted it as a shield. 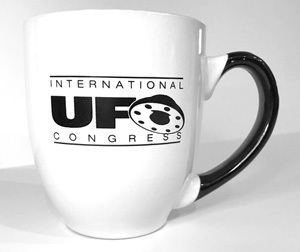 If I were to follow your line of thinking, today’s “flying saucers” are just that flying “saucers” – of the ‘teacup and saucer’ variety. They look like “saucers”, so that’s what they are. Makes sense, right? Are you so committed to holding onto Kenneth Arnold’s sighting as being the first one that you’re blind to the fact these objects have been observed for thousands of years? Apri gli occhi. Abre los ojos. Open your eyes. The ONE thing that seems to make it certain,is the Coin on the Left. Why in the Devil would a person(Far LEFT on coin)be LOOKING UP in the Sky at a Shield? thanks for the credit ! Aliens and UFO-s are only devils who wants to atract us to with the thing who us like in present,technology and mystery! These depictions are of UFOs that were seen in the air. They are alien craft that have been visiting the earth for thousands of years. even the Bible is full of these accounts and they thought they w ere angels or gods. They are not supernatural or demons, they are another hominoid species more advanced than us.